WICKED is back and L.A. loves it! The prize-winning Broadway musical, which first played in L.A. nine years ago and then returned for a record-breaking run two years later, has checked into the Pantages Theatre yet again. This time the cast is headed by Chandra Lee Schwartz (as Glinda) and Emma Raver-Lampman (as Elphaba). Note: Lampman is the standby for Emma Hunter, but the former played the role on opening night. 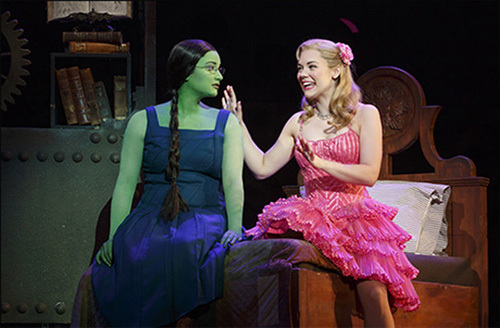 It almost doesnt matter who is starring in WICKED, so popular is the show. (The sold-out house started cheering lustily the minute the orchestra struck up). Its nice to report, though, that both leads lit up the stage all night long, thanks to their electrifying singing, dancing, clowning and emoting. They were backed up by some equally gifted supporting actors, notably Kim Zimmer as Madam Morrible and Tim Kazurinsky as The Wonderful Wizard of Oz. Actually, the entire cast of WICKED deserves praise of the highest order; this may be a third-generation road company, but there is nothing tired or stale about it. On the contrary, the show seemed as fresh and vital as it could be. Credit director Joe Mantello with not only keeping WICKEDS standards up, but getting maximum energy and enthusiasm out of the large company. Much of the shows enduring success-presently there are nine international road shows and two concurrent N. American tours-must be attributed to Stephen Schwartzs captivating music and Winnie Holzmans sprightly libretto. When you have a team like that and back up their contributions with the know-how and razzle-dazzle of such Broadway vets as set designer Eugene Lee, costumer Susan Hilferty, and lighting specialist Kenneth Posner-well, thats the ticket to success. America may not have invented the musical comedy, but it sure has perfected it.